To unlock an encrypted file, you must specify a password. 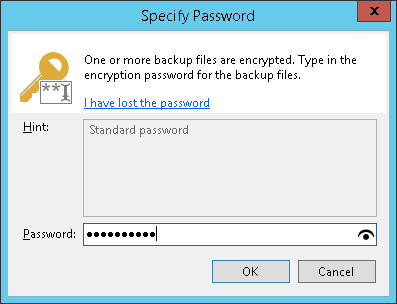 The password must be the same as the password that was used to encrypt the backup file. Import an encrypted backup file to the Veeam Backup & Replication console. After the import, the encrypted backup will appear under the Backups > Disk (encrypted) node in the inventory pane. In the inventory pane, select Disk (encrypted). In the working area, select the imported backup and click Specify Password on the ribbon or right-click the backup and select Specify password. In the Description field of the Specify Password window, Veeam Backup & Replication displays a hint for the password that was used to encrypt the backup file. Use the hint to recall the password. If you select a metadata file (VBM) for import, you must specify the latest password that was used to encrypt files in the backup chain. If you select a full backup file (VBK) for import, you must specify the whole set of passwords that were used to encrypt files in the backup chain. If you enter correct passwords, Veeam Backup & Replication will decrypt the backup file. The backup will be moved under the Backups > Disk (imported) node in the inventory pane. You can perform restore operations with the backup file in a regular manner. If you use Enterprise or Enterprise Plus Edition of Veeam Backup & Replication and the backup servers are connected to Veeam Backup Enterprise Manager, you can recover data from an encrypted backup even if the password is lost. For more information, see Decrypting Data Without Password.